Modern Villa in Tinajo on the west coast of Lanzarote, close to La Santa Sport and Playa de Famara. With stunning views of the chinijo archipiélago. Recently refurbished, this villa contains all the essentials for a relaxing holiday. Ideal as a base for surfers, kiters,, cyclists, divers etc. Also perfect for a family holiday due to the tranquility of the area, no traffic, wonderful scenery, spacious but still close to beaches and tourist attractions. Living room with big dining table , TV, DVD player. Terraces around the villa. Large pool area. 2 local golfcourses on Lanzarote, Both 15 minutes driving away. Outside: Sizable saltwater heated private swimmingpool, 10 x 3,50 meters. Cleaning / Towels / Linen / Maid service: Towels and linen included. 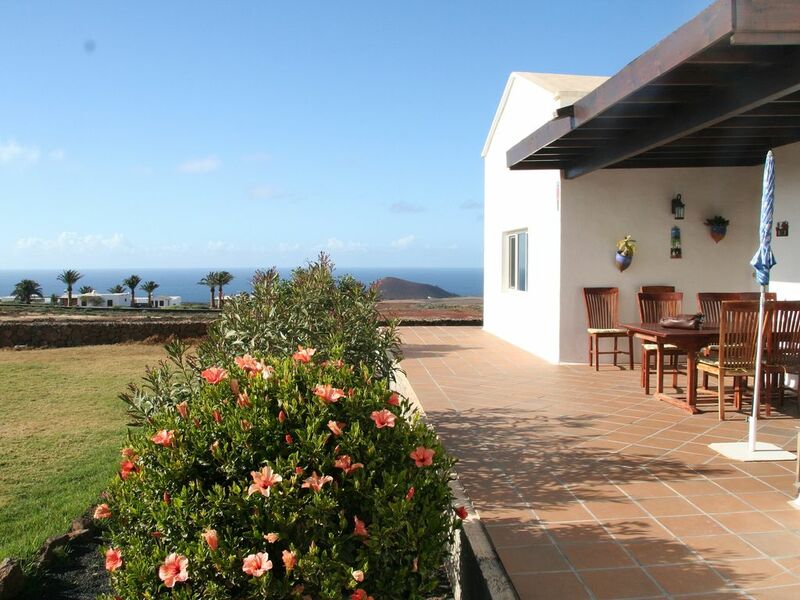 The villa is situated in Tinajo which is a town about 20km from Arrecife. It is spacious with 3 double bedrooms and very well equipped. The pool is a good size and was cleaned regularly by Svein during our stay. There is also a lawned area with a view of the sea in the distance. There is a Bbq and dining area by the pool which we made much use of. There are 3 restaurants within walking distance and the local supermarket was well stocked. La Santa is a short drive away with good restaurants too. We spent a brilliant 2 weeks at this villa which was a great base from which to explore the island. Our 12 and 15 year old daughters loved the pool. Svein was in regular contact to arrange to clean the pool and also kindly provided me with needle and thread when I needed it. Overall this is a beautiful villa on a beautiful island. Great host, perfect villa with wonderful views in a lovely part of the island. Thank you, great gests too. Lovely villa in a lovely setting - was like our home rather than a holiday let. Thanks so much Svein. Also - your coffee machine was AMAZING! We had a lovely stay at Tinajo, a quiet town with enough facilities to provide for day to day needs - the larger towns only 30 minutes away by car. The villa was delightful, everything was provided and of excellent quality. The owner's daughter was brilliantly helpful with any questions or issues with the villa. Best things were the private heated swimming pool and the grass where the children could play in the late evening sun. I would highly recommend it to another family...there was even a wooden play house! Merci beaucoup pour cette belle semaine passée à 4 dans un cadre splendide sur une île incroyable ! La maison était propre , spacieuse , bien équipée +++ ( un peu sonore ) . La piscine était parfaite ! Chauffée à 26-27 pour une météo peu clémente (15). Restos à Tinajo et à La Santa . A 2 pas de Timanfaya.